"Be Cool! Don't Be A Fool In School!" 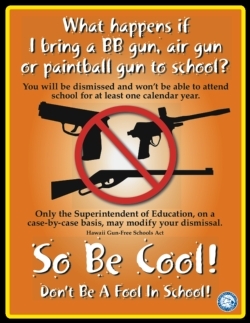 is the Department of Education's annual statewide campaign reminding parents and studetns that bringing a firearm, including air guns and any instrument that may be readily converted to expel a projectile, to school is a violation of the Hawai'i Gun-Free Schools Act. Any student who violates the Hawai'i Gun-Free Schools Act shall be removed from attending school for not less than one calendar year. Please discuss with your child/children the attached flyer emphasizing personal safety, what are appropriate safe school behaviors, and the consequences of violating the Hawai'i Gun-Free Schools Act.